The 2010 Lonely Planet: Africa travel guide states, “Perhaps more than anything else, it’s the braai* (barbecue) – an Afrikaner institution that has broken across race lines – that defines South African cuisine.” This is an amazing development, given that South Africa’s barbecue tradition long emphasized racial difference. Laurens van der Post wrote in African Cooking (1971) that Afrikaners (white South Africans) held a large braai every December 16 to commemorate the decisive victory on that date in 1838 of their expatriate European ancestors over the indigenous Zulu army. That battle propelled the country’s policies of racial separation and discrimination that formally ended in 1994. Since then, South Africans of all backgrounds have endeavored to forge a society that can overcome its painful history. As the American experience shows, legally ending discriminatory policies does not immediately translate into improved race relations. A critical step is a willingness to break down social barriers, to make an effort to get to know the “other.” Braai—short for braaivleis, which means “roast meat” in Afrikaans—has become a perfect vehicle for doing that in South Africa. No braai is complete without boerewors. Claud Cloete, a South African pentathlete who competed in the 1996 Olympics, shared with me that braai is usually done over a wood-burning fire and the typical meats cooked are boerewors (a thick beef sausage), pork or lamb chops, and chicken. In addition, no braai is complete without potjiekos, a spicy meat and vegetable stew. Cloete said that fewer braais happen in the crowded black townships (which still exist) because of space constraints and limited resources. Increasingly, white and black South Africans spend weekends at their suburban homes bonding over braai…together. For a few years now, South Africa has recognized an official National Braai Day in September. Archbishop Emeritus Desmond Tutu is the event’s official patron. The event specifically encourages fellowship across demographic groups. 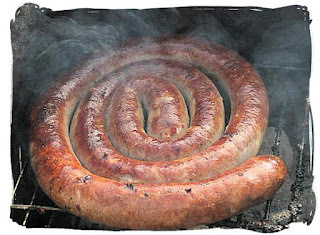 This year, National Braai Day falls on Monday, September 24 —so you still have time to order boereworsfrom your butcher.